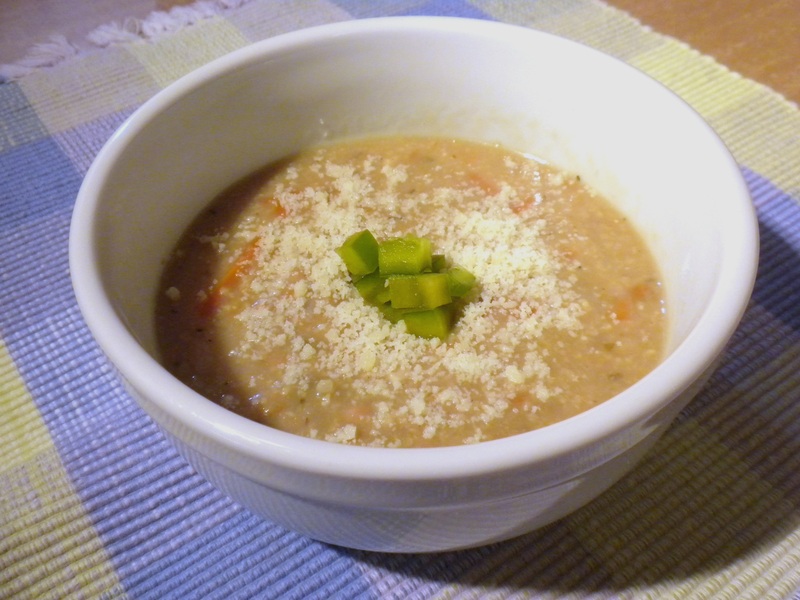 Are you wishing you could eat a nice, thick, creamy bowl of soup without sacrificing your diet? Does your mouth water when you see smooth, rich desserts even though you know you shouldn’t indulge? Do you “pass” on the gravy? Let me show you some ways to enjoy rich, thick textures in your meals that are guilt-free and nutritious without cramping your style. These methods can be used by anyone even though my particular recipes here are vegetarian. 1. Agar Flakes: You might recognize the name “agar agar” as something used in laboratory experiments and you’re right—it is used in petri dishes. Agar comes from seaweed. Food-quality agar is usually a blend of sea vegetables that have strong thickening properties. Agar is great for making gelatin-type dishes like aspics, desserts and pie fillings and it can be molded. It also comes in bars but I much prefer the flakes because they are so much faster and easier to use. To use agar flakes, add them to hot liquid and stir often until it is dissolved. Stirring helps prevent it from getting too thick and sticking to the bottom of the pot. Once the agar flakes are dissolved and have simmered about ten minutes, the mixture will thicken as it cools down. For the best taste and consistency, let your agar-gelled dish cool down outside of the refrigerator so it doesn’t get rubbery. After it is cooled, you can refrigerate it, covered. Like all sea vegetables, agar contains minerals–sodium, potassium, calcium, iodine, magnesium and iron are some. Agar is also considered to have medicinal properties and may relieve constipation if eaten several days in a row. Agar is good for vegetarians and vegans to know about as a replacement for gelatin which comes from pigs’ hooves or sometimes from other animals. If you are substituting agar flakes instead of gelatin in a recipe, you’ll need much less agar than you would gelatin. • Single Pie Crust, baked and cooled. You can use pastry, graham cracker, etc. Wash all the fruit and remove the stems and leaves. Cut only the large strawberries in half and leave the rest whole. Put the strawberries in a pot, sprinkle them with sea salt and pour the syrup over them. Add the agar flakes. Cover and simmer until the agar flakes are dissolved. This takes about 10 minutes. Stir occasionally to gently combine the ingredients. If necessary to get the agar fully dissolved, you may add a tablespoon or so of water. No other liquid. Add the blueberries for the last five minutes of cooking. 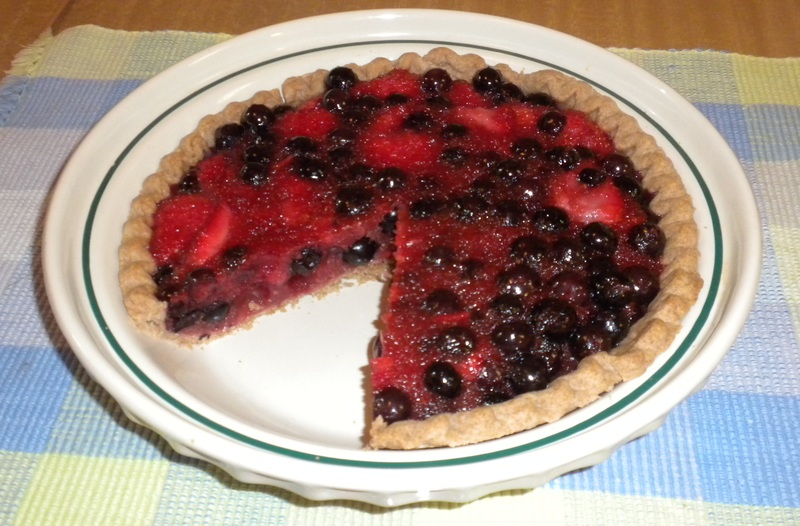 Pour the fruit mixture into the baked and cooled pie crust and let it set. 2. Kuzu: If you’ve ever been in the deep south of the U.S. you’ve probably seen these prolific vines with big leaves. They are so hardy and grow so fast they can take over an entire stand of trees in one season if they aren’t constantly cut back. The kind of kuzu (or kudzu) I use for cooking is a starch derived from the root of the plant. It comes from Japan in the form of white powdery lumps and is sometimes referred to as “wild arrowroot.” Kuzu can be used to thicken soups, sauces, desserts and even a hot drink. To use kuzu, crush the lumps up with the back of a spoon before measuring it and dissolve it in a little cool water or liquid first. You will need about a tablespoon of kuzu for every cup of liquid you want to thicken. When adding the dissolved kuzu into a hot liquid, stir constantly to prevent lumps. The dissolved kuzu will look cloudy at first, but as you stir and cook it will become clear. When it’s clear, it’s done. If the end result is not thick enough, add more kuzu. Add more liquid if your result is too thick. Kuzu does not have a strong flavor itself, so you can use it in many dishes without the kuzu interfering with the taste. Kuzu can be very soothing and is sometimes used in certain medicinal remedies for digestive troubles. Gently heat a cup of apple juice and a pinch of sea salt in a sauce pan. Bring this to just below a boil and take it off the burner. Dissolve about a teaspoon of kuzu powder in a quarter cup of water. Mix the kuzu and water into the apple juice while stirring constantly. Return the mixture to the stove and heat for a minute or so and serve. If you like, you can dress it up with a cinnamon stick. 3. Whole Grain Helper: We’ve all heard that eating whole grains is better for you. This is a great way to start incorporating them into your daily menu and introduce yourself and your family to the wide variety of types and uses for whole grains. I’m sure you aren’t new to the idea that cooking with grains can produce a thick and hearty soup or stew, such as a barley stew. Many grains can be used as thickeners including brown rice, oats, buckwheat and millet. Sometimes I use the whole grain and sometimes I use a milled or flaked version. An added plus is that when you use whole grains along with beans in a dish, you get what is known as a “complete protein.” In otherwords, a food that has all the needed requirements to provide good, useable protein to your body. One of my favorite grains to thicken the pot with is millet. Millet is an ancient grain that comes from Africa and India. You might recognize the tiny yellow balls of millet in your favorite birdseed mix! Millet is an excellent grain for people to eat. To help you know more about millet, you can check out this information: http://chetday.com/millet.html . Put the millet into a bowl and rinse with cold water, draining the water off and rinsing again. Use your hand or a sieve to keep from losing the millet when you drain the water. Put the millet in a small pot with 2 cups of water and a pinch of sea salt and bring it to a boil. Simmer the millet until it is soft, 20-25 minutes. If the water is gone and the millet needs more cooking, just add more water. You want your millet to be soft and somewhat wet. While the millet’s cooking, begin sautéing the other vegetables in a 3-4 quart pot. Heat the olive oil and sauté the onions first. Put in a pinch of sea salt and sauté the onions until they are translucent and sweet-smelling, then add carrots and another pinch of sea salt and sauté them. Last, add the celery, another pinch of salt and sauté that. Add four cups of water, your cooked beans and any seasonings or herbs and simmer for 20-30 minutes. Blend the cooked millet until it is smooth and creamy. I like using an electric hand blender because you can blend right in the cooking pot and you’ll have less to clean up. Add the creamy millet and stir to incorporate it into the soup. If it is too thick, simply add a little bit more water. Season with a couple teaspoons of soy sauce. Voila! You have a thick, creamy protein-rich soup or stew. Serve with a garnish of parsley, sliced scallions or if you use dairy products, some grated parmesan cheese. 4. Reduction: Ooh La La! The very name “reduction sauce” sounds so haute cuisine! It is really very easy to make and can have a nearly unlimited variety of flavors. A reduction sauce is made by simmering liquids down in order to slightly thicken them and intensify their flavors. It is most often done after cooking meats by simmering the cooking juices with other things such as wine, vinegar, or cream and getting a very rich concentrated sauce. But reduction sauces are by no means limited to meat juices. You can reduce many kinds of liquids including fruit juice by simmering them in an open pan (no lid) and letting the liquid evaporate until you have the desired finished product. Heat the olive oil up in a heavy skillet and add the garlic, quickly followed by the mushrooms and a pinch of sea salt. Sauté the mushrooms until they start to get tender. 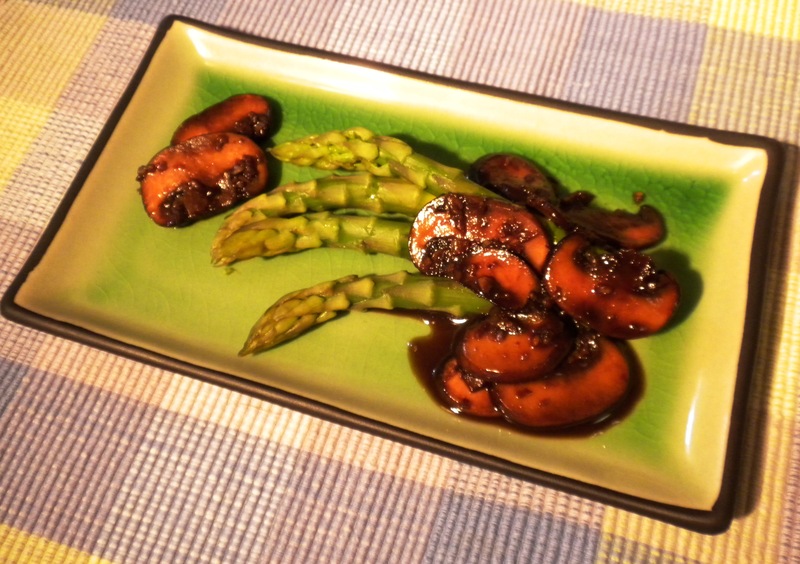 Add balsamic vinegar, water, soy sauce and syrup or sweetener and stir to combine them. Let the mushrooms and liquid simmer until the sauce has thickened to your liking and turn off the heat. Use this as a sauce for grain dishes, cooked tofu dishes or steamed or boiled vegetables. I like it on steamed fresh green beans or asparagus. This makes about a half cup, enough for 2-3 servings. I think you can see that these methods and ingredients for adding texture, richness and of course thickness to your menu are healthy and nutritious. They are useful for any type of diet—omnivore, vegetarian or vegan. You don’t have to rely on heavy cream, flour and butter when you’ve got these alternatives. Purchase items such as kuzu, agar flakes, naturally brewed soy sauce and whole grains at a natural foods store or order them online if you can’t find them locally. I’d love to hear about your experimentation with these ingredients and methods and if you want to share your own recipes, that would be wonderful too! For additional free recipes using these techniques, you are invited to join PATTY’S CLUB! Just go to my new Patty’s Club Page https://mycookinglife.com/pattys-club/ and follow the directions.